Susan trained at Trinity College, London, under Vera Kantrovitch, winning the Gladys Puttick Prize for best student. She has performed solo recitals at Wigmore Hall and in various venues around the country as well as leading several chamber ensembles. She is an experienced freelance musician and soloist, currently leading the Rossini Chamber Orchestra. Jane studied with Lionel Bentley and Clarence Myerscough at the Royal Academy of Music. She manages to balance her freelance career with teaching and illustrating children's books. As a viola player she is a long-term member of the Becker String Quartet which is based in Canterbury and has played with the Royal Philharmonic Orchestra and the London Concert Orchestra. In London's West End she has played for "Lend me a Tenor" and award winning "Sweeney Todd" as well as taking part in international tours of Les Miserables and War of the Worlds. 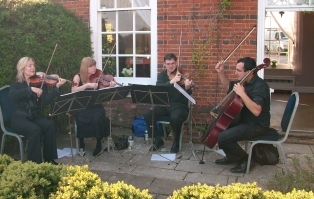 Adrian studied music at Holloway College, London University and at Trinity College of Music and, continuing his studies with Roger Best, violist with the Alberni Quartet. As a freelance musician he has worked with the Royal Philharmonic, London Philharmonic, BBC Concert and Symphony Orchestra. Solo engagements have included Bartok's concerto and Hindemith Trauermusik. 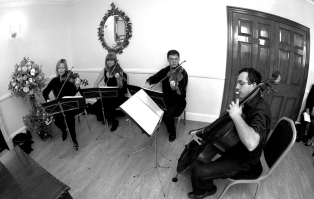 He has been active in the chamber music fields with quartet, flute, viola and harp, and has recorded various soundtracks for film and television including League of Gentlemen, Travis and Paul McCartney. He has recently recorded albums with the Pet Shop Boys and Robbie Williams, and toured in Scandinavia and China with Elaine Page. West End work includes Phantom of the Opera, Les Miserables, Love never Dies, Ghost, Lend me a Tenor and Sweeney Todd. Nick's playing credits are many and varied. He is a band member with Jamie Scott & The Town and in 2008 completed a World Tour as support to Take That. His pop credits also include Kelly Clarkson, Pet Shop Boys and Gabriella Cilmi. Some of Nick recent classical work includes BBC Radio 3 Pre-concert prom - Holloway; UK Premiere, Britten Theatre Elton John's summer ball quartet Queen's Jubilee Concert - Buckingham Palace Festival di Battingano, Tuscany Italy Memorial Concert for the late Sir George Solti and his family - Italy Concertante Soloist with Rachel Podger - Canterbury Tchaikovsky - Rococo Variations, Amici Orchestra - Charing. During his career he has played with the Royal Philharmonic Orchestra, the BBC Concert Orchestra, the Bournemouth Symphony Orchestra, and he plays regularly in the West End productions of Wicked and The Lion King.